In 2011, oncologic imaging took another step forward when two versions of combination PET/MR imaging (PET/MRI) were approved for use in the United States. The first, which took what is known as the “sequential approach,” placed a PET scanner and MRI scanner in tandem in the same room, with a rotatable bed that enabled the patient to be transferred from one gantry to the other. The contrasting technical approaches of sequential and integrated PET/MRI scanners have led to different imaging protocols. The sequential approach minimizes interference between the MRI magnetic fields and the PET component, while the simultaneous approach offers the potential benefit of a shorter acquisition time through parallel imaging. 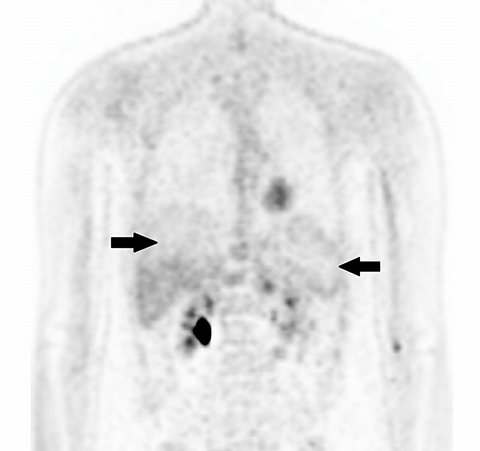 17 A comparison of imaging workflows between whole body 18FDG PET/CT, sequential PET/MRI and integrated PET/MRI is shown in Figure 1. The sequential protocol attempts to compensate for a potentially longer imaging time relative to the integrated scanner by performing some MR sequences early after FDG injection. The Dixon sequence is performed to improve anatomic localization of PET radiotracer uptake over that possible with the MRAC sequence. Note that if additional dedicated MR images are not required, a whole body PET/MRI scan may not take longer than a conventional PET/CT scan. However, the only benefit of PET/MR over PET/CT in that scenario is radiation reduction from the CT component of PET/CT. It can be argued that, to fully reap the benefit of PET/MRI, the MRI component should be used to perform full anatomic exams during the same imaging session as the PET exam. Lymphoma staging and disease monitoring are among the most common indications for PET imaging in pediatric oncology.1 Initial studies in adult populations comparing the diagnostic performance of PET/CT and PET/MRI have established PET/MRI as an alternative modality in the initial staging of lymphoma. 18-20 Thus far, only two series have been published comparing PET/MRI with PET/CT in a pediatric lymphoma population.15,21 Neither study reported a significant difference in diagnostic performance; however, both studies had small patient populations (40 and 9 paired exams, respectively), thereby limiting their statistical power. PET/MRI findings are a combination of features from the standalone modalities. Nodal involvement is typified by enlarged rounded lymph nodes, which lack a fatty hilum and demonstrate diffusion restriction. Central necrosis is unusual compared with other malignancies. Extranodal disease is often hypointense to surrounding parenchyma on T1-weighted sequences and slightly hyperintense on T2-weighted imaging. Most lymphomas demonstrate high FDG uptake (Figure 3). Central nervous system (CNS) tumors are the most common solid tumors in children.1 Although 18FDG-PET imaging is not routinely performed in pediatric brain tumors, it can have a role to play, particularly in high-grade tumors. 18FDG-PET can be used to improve the diagnostic yield of stereotactic biopsies, to help guide the surgeon in achieving total resection, and to increase detection of residual/ recurrent tumor.22 Interpretation of 18FDG-PET is especially challenging in low-grade tumors, in which 18FDG-uptake may be similar to that of normal white matter.1,23 False-negative results have been shown in adults in cases of chronic inflammation and foreign body granulomata.24 As MRI is inherently superior to CT in the anatomic evaluation of brain parenchyma, 18FDG PET/MRI has an advantage over 18FDG PET/CT, with the potential to accurately characterize CNS anatomy in a single imaging session, thereby preventing the need for a separate MRI exam and subsequent image fusion (Figure 4). Amino acid PET radiotracers, such as 11C-methionine, 18F-fluoroethyltyrosine, and 18F-fluoro-l-dihydroxy-phenylalanine (F-DOPA), evaluate local protein metabolism and can be very useful in pediatric brain tumors, as they have a high tumor-to-normal brain tissue contrast. 25 Fused 18F-DOPA PET and conventional MRI was found to provide a diagnostic or therapeutic contribution in 69% of patients when evaluated in a small cohort of children with infiltrative astrocytoma.26 However, these PET radiotracers are not approved for clinical use in the United States, and the availability of 11C-methionine is further limited to centers with an in-house cyclotron due to its short half-life (20 minutes). Pediatric histiocytic disorders encompass a diverse group of rare syndromes caused by the proliferation of white blood cells called histiocytes. The most common histiocytic disorder, Langerhan’s cell histiocytosis (LCH) involves the clonal proliferation of activated dendritic cells and macrophages. Traditionally, it has been divided into three groups: unifocal eosinophilic granuloma, single-system multifocal, and multifocal multisystem disease. 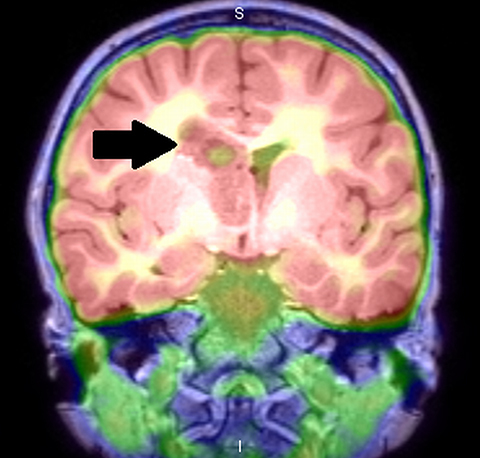 Prognosis is determined by the involvement of at-risk organs and response to treatment, and clinical course varies from self-limited to progressive and even fatal.27 Skeletal surveys, nuclear medicine bone scans, CT and MRI have been the traditional imaging methods for evaluation of LCH organ involvement. In recent years a growing body of literature is supporting the superiority of PET/CT compared with conventional imaging.28-30 Data from our institution demonstrated PET/MRI to be a feasible alternative to PET/CT, detecting 96% of active disease seen on PET/CT while maintaining strongly correlated quantitative information and similar image quality.31 Another study that compared 18FDG-PET scans with MRIs separately and side-by-side found FDG-PET to be superior for lesion surveillance because of a lower number of post-chemotherapy, false-positive findings. 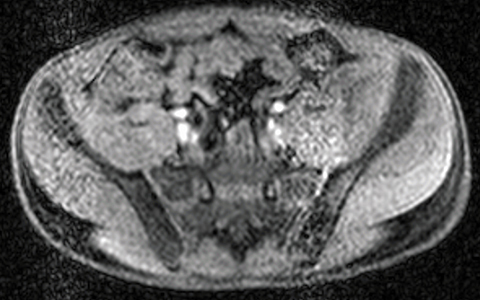 Perilesional edema on T2-weighted MRI sequences and contrast enhancement are hallmarks of lesional activity, which also demonstrate high FDG uptake on 18FDG-PET.32 The potential utility of simultaneous whole-body PET/MRI as the primary imaging modality for the evaluation of pediatric histiocytosis requires development of protocols that capture the metabolic information of FDG with the soft tissue characterization of MRI to accurately detect and characterize lesions. In theory, PET/MRI offers advantages over PET/CT in the evaluation of primary bone and soft tissue tumors because of inherently higher soft-tissue contrast and superior marrow evaluation. Classification of cortical bone lesions is a potential concern because of the limitations of MRAC. However, a large adult study demonstrated no significant difference in the correct classification of 98 malignant bone lesions with PET/MRI compared to PET/CT.38 PET/MRI findings are a combination of features from the standalone modalities and the appearance of the primary tumor varies depending on the underlying histology. Metastatic disease is typified by focal low T1 signal, edema-like signal on T2-weighted imaging, and heterogeneous contrast enhancement. Most bone and soft-tissue tumors demonstrate high FDG uptake (Figure 5). A large study comparing the accuracies of CT, MR imaging, and bone scintigraphy found that MRI alone and bone scan alone demonstrated similar sensitivities for skeletal metastases.45 Moreover, diffusion-weighted imaging is useful in assessing neuroblastoma, particularly in evaluating response to treatment. 46 Although no studies to date have evaluated PET/MRI in neuroblastoma, the combination of PET imaging, particularly using newer agents such as 18F-DOPA, with the inherent strengths of MRI, intuitively seems to hold considerable potential for disease evaluation. PET/MRI remains a novel modality for the evaluation of pediatric malignancies. Optimal management of tumors in children requires tests that are accurate for disease detection, lesion characterization, and disease surveillance. Minimizing exposure to ionizing radiation is particularly important in children, especially considering how frequently they are reimaged in pediatric oncology. Technological advancements aim to create integrated imaging that can yield a comprehensive diagnosis during a single patient encounter. While PET/CT is a sensitive and specific modality for the evaluation of pediatric malignancies, PET/MRI has been attracting attention due to MRI’s superior tissue characterization properties relative to CT, and because of concern regarding cumulative ionizing radiation exposure. Further studies are needed to establish the diagnostic accuracies and clinical impact of PET/MRI for specific diagnoses. Uslu L, Donig J, Link M, et al. 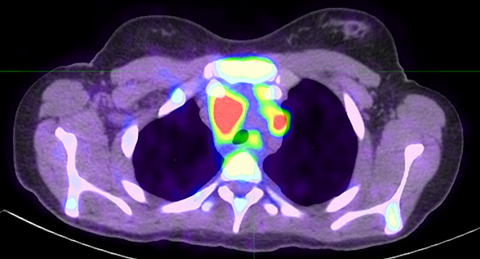 Value of 18F-FDG PET and PET/CT for evaluation of pediatric malignancies. J Nucl Med. 2015;56(2):274-286. Odalovic S, Sobić-Saranović D, Pavlovic S, et al. . Preliminary experience with 18f-fluoro-deoxy-glucose positron emission tomography/computed tomography in pediatric oncology patients. Acta Chir Iugosl. 2011;58(4):67-73. Wegner EA, Barrington SF, Kingston JE, et al. The impact of PET scanning on management of paediatric oncology patients. Eur J Nucl Med Mol Imaging. 2005;32(1):23-30. Jadvar H, Colletti PM. Competitive advantage of PET/MRI. Eur J Radiol. 2014;83(1):84-94. Brendle CB, Schmidt H, Fleischer S, et al. Simultaneously acquired MR/PET images compared with sequential MR/PET and PET/CT: alignment quality. Radiology. 2013;268(1):190-199. Hofmann M, Bezrukov I, Mantlik F, et al. MRI-based attenuation correction for whole-body PET/MRI: quantitative evaluation of segmentation- and atlas-based methods. J Nucl Med. 2011;52(9):1392-1399. Nguyen NC, Vercher-Conejero JL, Sattar A, et al. Image quality and diagnostic performance of a digital PET prototype in patients with oncologic diseases: Initial experience and comparison with analog PET. J Nucl Med. 2015;56(9):1378-1385.
von Schulthess GK, Burger C. Integrating imaging modalities: what makes sense from a workflow perspective? Eur J Nucl Med Mol Imaging. 2010;37(5):980-990. Slomka PJ, Pan T, Germano G. Recent advances and future progress in PET instrumentation. Semin Nucl Med. 2016;46(1):5-19. Suljic A, Tomse P, Jensterle L, et al. The impact of reconstruction algorithms and time of flight information on PET/CT image quality. Radiol Oncol. 2015;49(3):227-233. Kuhn FP, Crook DW, Mader CE, et al.. Discrimination and anatomical mapping of PET-positive lesions: comparison of CT attenuation-corrected PET images with coregistered MR and CT images in the abdomen. Eur J Nucl Med Mol Imaging. 2013;40(1):44-51. Schulz V, Torres-Espallardo I, Renisch S, et al. Automatic, three-segment, MR-based attenuation correction for whole-body PET/MR data. Eur J Nucl Med Mol Imaging. 2011;38(1):138-152. Lyons K, Seghers V, Williams JL, et al. Qualitative FDG PET image assessment using automated three-segment MR attenuation correction versus CT attenuation correction in a tertiary pediatric hospital: A prospective study. AJR. Am J Roentgenol. 2015;205(3):652-658. Lyons K, Seghers V, Sorensen JI, et al. Comparison of standardized uptake values in normal structures between PET/CT and PET/MRI in a tertiary pediatric hospital: A prospective study. AJR. Am J Roentgenol. 2015;205(5):1094-1101. Sher AC, Seghers V, Paldino MJ, et al. Assessment of sequential PET/MRI in comparison with PET/CT of pediatric lymphoma: A prospective study. AJR. Am J Roentgenol. 2016;206(3):623-631. Bezrukov I, Schmidt H, Gatidis S, et al. Quantitative evaluation of segmentation- and atlas-based attenuation correction for PET/MR on pediatric patients. J Nucl Med. 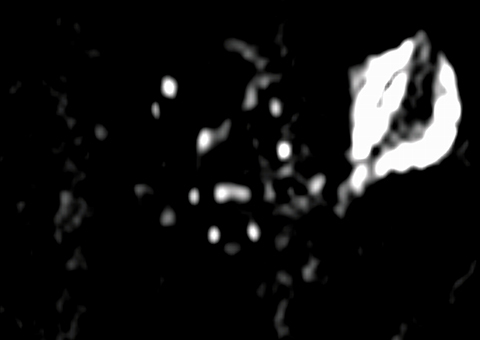 2015;56(7):1067-1074. Gatidis S, la Fougere C, Schaefer JF. 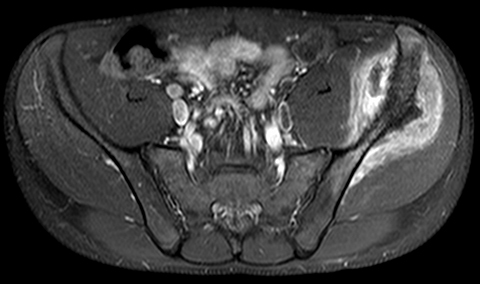 Pediatric oncologic imaging: A key application of combined PET/MRI. RoFo. 2016;188(4):359-364. Giraudo C, Raderer M, Karanikas G, et al. 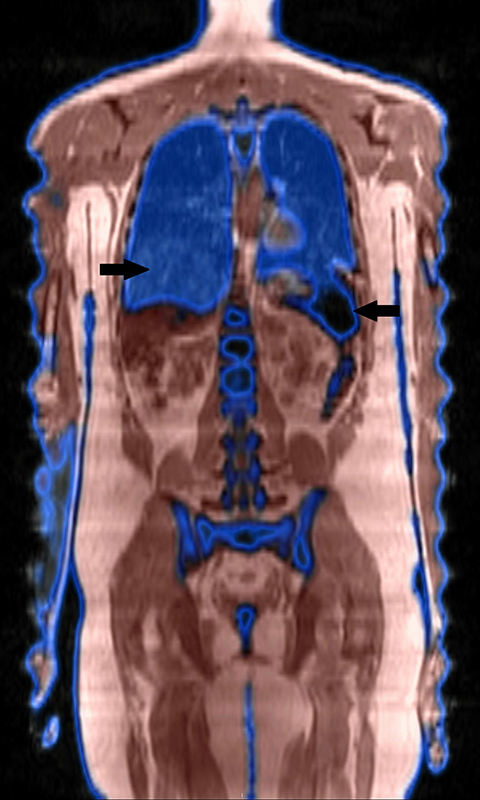 18F-Fluorodeoxyglucose positron emission tomography/magnetic resonance in lymphoma: Comparison with 18 fluorodeoxyglucose positron emission tomography/computed tomography and with the addition of magnetic resonance diffusion-weighted imaging. Invest Radiol. 2016;51(3):163-169. Platzek I, Beuthien-Baumann B, Ordemann R, et al. FDG PET/MR for the assessment of lymph node involvement in lymphoma: initial results and role of diffusion-weighted MR. Acad Radiol. 2014;21(10):1314-1319. Heacock L, Weissbrot J, Raad R, et al. PET/MRI for the evaluation of patients with lymphoma: initial observations. AJR. Am J Radiol. 2015;204(4):842-848. Ponisio MR, McConathy J, Laforest R, et al. Evaluation of diagnostic performance of whole-body simultaneous PET/MRI in pediatric lymphoma. Pediatr Radiol. 2016;46(9):1258-1268. Zukotynski K, Fahey F, Kocak M, et al. 18F-FDG PET and MR imaging associations across a spectrum of pediatric brain tumors: a report from the pediatric brain tumor consortium. J Nucl Med. 2014;55(9):1473-1480. Stanescu L, Ishak GE, Khanna PC, et al. FDG PET of the brain in pediatric patients: imaging spectrum with MR imaging correlation. Radiographics. 2013;33(5):1279-1303. Estrada G, Gonzalez-Maya L, Celis-Lopez MA, et al. Diagnostic approach in suspected recurrent primary brain tumors using (18)FDG-PET/MRI, perfusion MRI, visual and quantitative analysis, and three dimensional stereotactic surface projections. First experience in Mexico. Rev Esp Med Nucl. 2008;27(5):329-339. Fraioli F, Shankar A, Hargrave D, et al. 18F-fluoroethylcholine (18F-Cho) PET/MRI functional parameters in pediatric astrocytic brain tumors. Clin Nucl Med. 2015;40(1):e40-45. Morana G, Puntoni M, Garre ML, et al. Ability of (18)F-DOPA PET/CT and fused (18)F-DOPA PET/MRI to assess striatal involvement in paediatric glioma. Eur J Nucl Med Mol Imaging. 2016;43(9):1664-1672. Azouz EM, Saigal G, Rodriguez MM, et al. Langerhans’ cell histiocytosis: pathology, imaging and treatment of skeletal involvement. Pediatr Radiol. 2005;35(2):103-115. Gelfand MJ, Sharp SE, Palumbo JS. 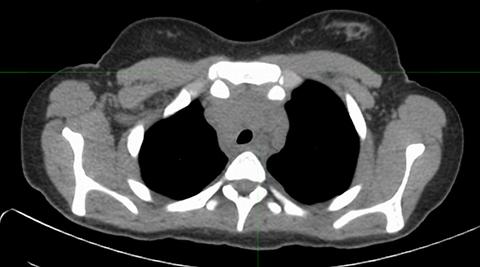 Selective CT for PET/CT: dose reduction in Langerhans cell histiocytosis. Pediatr Radiol. 2015;45(1):81-85. Kaste SC, Rodriguez-Galindo C, McCarville ME, et al. PET-CT in pediatric Langerhans cell histiocytosis. Pediatr Radiol. 2007;37(7):615-622. Phillips M, Allen C, Gerson P, et al. Comparison of FDG-PET scans to conventional radiography and bone scans in management of Langerhans cell histiocytosis. Pediatr Blood Cancer. 2009;52(1):97-101. Sher AC, Orth R, McClain K, Allen C, Hayatghaibi S, Seghers V. PET/MR in the assessment of pediatric histiocytoses: A comparison to PET/CT. Clin Nucl Med. 2017;42(8):582-588. doi: 10.1097/RLU.0000000000001717. Mueller WP, Melzer HI, Schmid I, et al. 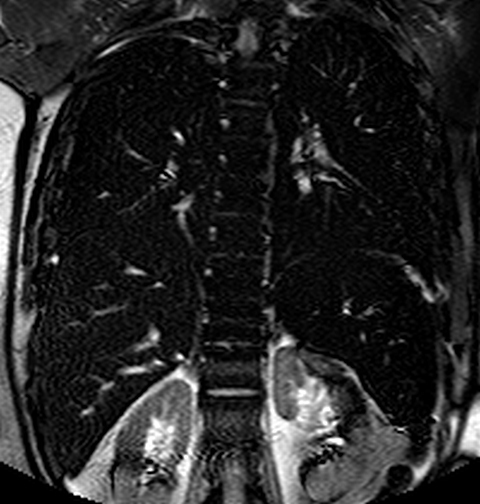 The diagnostic value of 18F-FDG PET and MRI in paediatric histiocytosis. Eur J Nucl Med Mol Imaging. 2013;40(3):356-363. Tateishi U, Hosono A, Makimoto A, et al. Accuracy of 18F fluorodeoxyglucose positron emission tomography/computed tomography in staging of pediatric sarcomas. J Pediatr Hematol Oncol. 2007;29(9):608-612. Quartuccio N, Fox J, Kuk D, et al. Pediatric bone sarcoma: diagnostic performance of (1)(8)F-FDG PET/CT versus conventional imaging for initial staging and follow-up. AJR. Am J Roentgenol. 2015;204(1):153-160. London K, Stege C, Cross S, et al. 18F-FDG PET/CT compared to conventional imaging modalities in pediatric primary bone tumors. Pediatr Radiol. 2012;42(4):418-430. Newman EN, Jones RL, Hawkins DS. An evaluation of [F-18]-fluorodeoxy-D-glucose positron emission tomography, bone scan, and bone marrow aspiration/biopsy as staging investigations in Ewing sarcoma. Pediatr Blood Cancer. 2013;60(7):1113-1117. Mody RJ, Bui C, Hutchinson RJ, et al. FDG PET imaging of childhood sarcomas. Pediatr Blood Cancer. 2010;54(2):222-227. Eiber M, Takei T, Souvatzoglou M, et al. Performance of whole-body integrated 18F-FDG PET/MR in comparison to PET/CT for evaluation of malignant bone lesions. J Nucl Med. 2014;55(2):191-197. Brisse HJ, McCarville MB, Granata C, et al. Guidelines for imaging and staging of neuroblastic tumors: consensus report from the International Neuroblastoma Risk Group Project. Radiology. 2011;261(1):243-257. Matthay KK, Shulkin B, Ladenstein R, et al. Criteria for evaluation of disease extent by (123)I-metaiodobenzylguanidine scans in neuroblastoma: a report for the International Neuroblastoma Risk Group (INRG) Task Force. Br J Cancer. 2010;102(9):1319-1326. Bleeker G, Tytgat GA, Adam JA, et al. 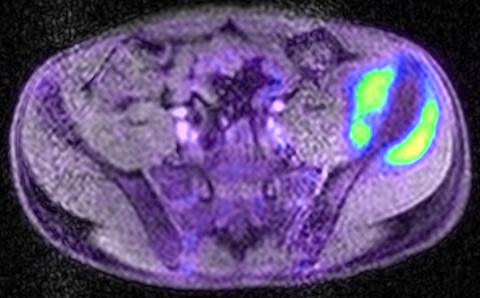 123I-MIBG scintigraphy and 18F-FDG-PET imaging for diagnosing neuroblastoma. Cochrane Database Syst Rev. 2015(9):CD009263. Piccardo A, Puntoni M, Lopci E, et al. Prognostic value of (1)(8)F-DOPA PET/CT at the time of recurrence in patients affected by neuroblastoma. Eur J Nucl Med Mol Imaging. 2014;41(6):1046-1056. Lopci E, Piccardo A, Nanni C, et al. 18F-DOPA PET/CT in neuroblastoma: comparison of conventional imaging with CT/MR. Clin Nucl Med. 2012;37(4):e73-78. Piccardo A, Lopci E, Conte M, et al. Comparison of 18F-dopa PET/CT and 123I-MIBG scintigraphy in stage 3 and 4 neuroblastoma: a pilot study. Eur J Nucl Med Mol Imaging. 2012;39(1):57-71. Siegel MJ, Ishwaran H, Fletcher BD, et al. 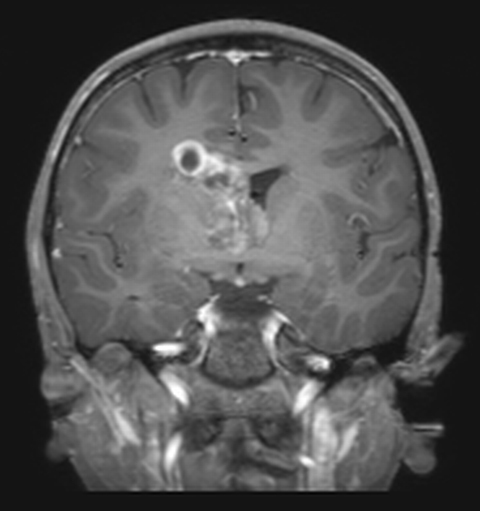 Staging of neuroblastoma at imaging: report of the radiology diagnostic oncology group. Radiology. 2002;223(1):168-175. Uhl M, Altehoefer C, Kontny U, et al. MRI-diffusion imaging of neuroblastomas: first results and correlation to histology. Eur Radiol. 2002;12(9):2335-2338. Lyons K, Sher A, Orth R, Seghers V. The utility of PET/MRI in pediatric malignancies. Appl Radiol. 2018;47(10):14-18. Dr. Lyons is a Radiologist at Arkansas Children’s Hospital, Little Rock, AR; Dr. Sher, Dr. Orth, and Dr. Seghers are Pediatric Radiologists at Texas Children’s Hospital, Houston, TX. The authors have no conflicts of interest to declare.